In Dec 1977 James D Jacob (Jake) and eldest son James Jr. (Bud) co-founded the Jacob Co. At that time Jake was the Vice-President with Central Hardware Corporation working out of their national headquarters in Bridgeton, Mo. His duties included overseeing the installed products division for all the stores throughout the Midwest. He saw firsthand the 2 most common traits contractors possess. They over promise and under deliver. Jake approached Bud in the fall of ’77 and said “if we run a home improvement company on 2 simple principles we can be very successful. First, we have to really “care” for our customers and listen to their wishes. Second, simply do what we say we are going to do. Jake and Bud quickly set their plan into motion. After convincing the bank to lend them needed start-up money they soared into the small business world. The two of them had no idea this new venture would grow into one of the region’s premier small businesses with national recognition. Throughout the 80’s into the mid 90’s Jacob became the largest wholesale seamless gutting company in the St Louis Metro region running as many as 10 seamless guttering trucks a day. This changed when Bud decided to leave the company to pursue other interests. Bud sold out to his father in 1994 and his younger brother Scott took the reigns as President of Jacob. Scott had plans of his own and took the company in a different direction. Scott’s vision was to change Jacob from the wholesale sub contract side of the industry to the retail side and compete against the larger remodeling companies in the region. This move created a new face for the company. By the year 2000 Jacob had solidified itself as an innovative leader in the home improvement industry with National recognition as an elite remodeler in several product lines. The company endured a difficult change in 2001 when Jake passed away after a long battle with cancer. He left behind a family business that to this day still believes in the values they started with in 1977. Jake left his shares to his wife, Geraldine. Geraldine passed in 2009 and her shares were divided among her 5 kids. In 2006 Bud came back to the Jacob full time. Bud’s return gave his brother Scott the time needed to work on growing the company. Scott looked at various products and ideas before finding the right fit and Jacob Showers and Bath’s was created as a division of Jacob. The Bath division has been a great success! After the bath division success Scott and Bud decided to take another direction. “Growth by acquisition”! The brothers wanted to find and purchase a company that fit the Jacob model of a family atmosphere, longevity, quality of products and reputation with solid financial stability. Scott found a perfect fit when he met with Tom Chesley of Chesley Fence. In 2013 Scott and Bud purchased Chesley Fence owned by Tom and Patty Chesley. Chesley was a 47 year old Family Owned company with the same values as Jacob. Tom and Patty wanted to slow down and the fit was perfect. Tom and Patty both still work with Chesley Fence and Deck. The second acquisition in 2015 was an asset purchase of Daech and Bauer Roofing and Remodeling owned by Jim Daech. Jim had endured the tough times of a recession and the lack of roofing work after the record hail storm of 2012. 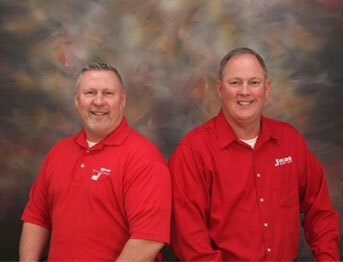 Jim wanted to pursue his career in accounting and sold to the Jacob brothers. Jim is now a partner in the new Daech and Bauer Roofing. In June of 2016 the Chesley office was moved into the same building as Jacob Sunroom and Exteriors, Jacob Showers and Baths and Daech and Bauer Roofing. Jacob is still family owned and operated. Scott Jacob CEO and Bud Jacob President/GM and co-founder of Jacob are still here. Bud and Scott work together with an incredible staff to keep Jacob Family Enterprises, Inc. at the top of the remodeling industry. The Jacob boys are proud of their companies and the outstanding employees that run it.